LE CANDIDAT DESIRANT SUIVRE CETTE FILIERE DOIT ETRE AGE DE 15 ans AU MINIMUM. * UNE EVALUATION OBLIGATOIRE SERA EFFECTUEE AVANT LA FORMATION DE CONDUITE. * 20 COURS DE CONDUITE MINIMUM SERONT OBLIGATOIRES . * UN RENDEZ PREALABLE OBLIGATOIRE EQUIVALENT A 2 COURS REUNISSANT LE CANDIDAT, L' ACCOMPAGNATEUR ET LE MONITEUR AFIN DE " PASSER LE RELAIS " . 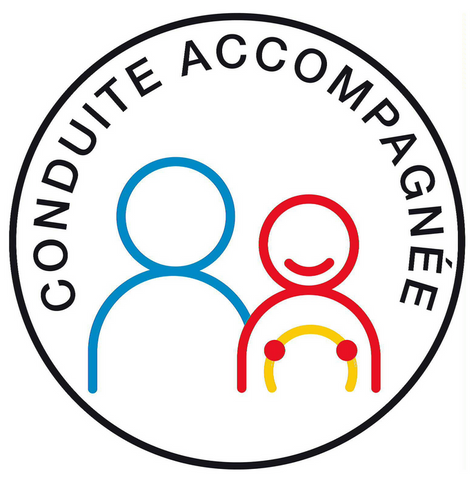 * 2 RDV PEDAGOGIQUES OBLIGATOIRES ,EQUIVALENTS A 3 COURS , SERONT ORGANISES AVANT DE PASSER L EXAMEN DE CONDUITE . LE CANDIDAT POURRA PASSER SON EXAMEN DU PERMIS DE CONDUIRE A PARTIR DE 17ANS ET DEMI A CONDITION D AVOIR EU AU MOINS 12 MOIS DE CONDUITE ACCOMPAGNEE. L'EXAMEN PRATIQUE DE CONDUITE A UNE DUREE DE 32 MINUTES ET SE REALISE SUR UN PARCOURS EN AGGLOMERATION ET HORS AGGLOMERATION DURANT LEQUEL DES MANOEUVRES, DES VERIFICATIONS INTERIEURES OU EXTERIEURES ET DES QUESTIONS DE PREMIERS SECOURS SERONT DEMANDES. TOUT AU LONG DE CETTE EPREUVE, LE CANDIDAT DOIT ETRE AUTONOME ET RESPECTUEUX DES REGLES DU CODE DE LA ROUTE. SI LE RESULTAT DE CETTE EXAMEN EST FAVORABLE( 20/31 MINIMUM), L INSPECTEUR DELIVRE UN TITRE DE CIRCULATION PROVISOIRE ( CEPC ) VALABLE 4 MOIS . LE CANDIDAT POURRA CIRCULER SEUL A PARTIR DE SES 18 ANS AVEC CE DOCUMENT ET UNE PIECE D'IDENTITE. DES LES 18 ANS DU CANDIDAT, L'AUTO ECOLE DEMANDERA A L'ANTS LA FABRICATION DU PERMIS DE CONDUIRE DEFINITIF QUI SERA EXPEDIE AU DOMICILE DU CANDIDAT PAR COURRIER POSTAL RECOMMANDE DIRECTEMENT PAR L'ORGANISME D'ETAT.